We can judge whether Raymond James Financial, Inc. (NYSE:RJF) is a good investment right now by following the lead of some of the best investors in the world and piggybacking their ideas. There’s no better way to get these firms’ immense resources and analytical capabilities working for us than to follow their lead into their best ideas. While not all of these picks will be winners, our research shows that these picks historically outperformed the market when we factor in known risk factors. Is Raymond James Financial, Inc. (NYSE:RJF) a superb investment now? The smart money is becoming less hopeful. The number of long hedge fund bets fell by 6 lately. Our calculations also showed that RJF isn’t among the 30 most popular stocks among hedge funds. RJF was in 25 hedge funds’ portfolios at the end of December. There were 31 hedge funds in our database with RJF positions at the end of the previous quarter. Let’s view the fresh hedge fund action regarding Raymond James Financial, Inc. (NYSE:RJF). How have hedgies been trading Raymond James Financial, Inc. (NYSE:RJF)? Heading into the first quarter of 2019, a total of 25 of the hedge funds tracked by Insider Monkey held long positions in this stock, a change of -19% from the previous quarter. 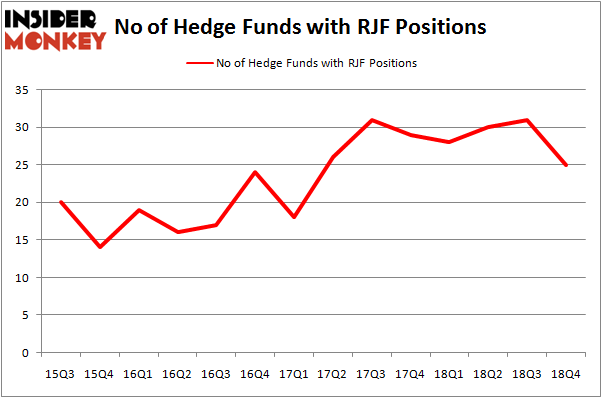 On the other hand, there were a total of 28 hedge funds with a bullish position in RJF a year ago. So, let’s check out which hedge funds were among the top holders of the stock and which hedge funds were making big moves. When looking at the institutional investors followed by Insider Monkey, Andreas Halvorsen’s Viking Global has the number one position in Raymond James Financial, Inc. (NYSE:RJF), worth close to $185.5 million, corresponding to 1.1% of its total 13F portfolio. The second most bullish fund manager is Glenn Greenberg of Brave Warrior Capital, with a $168.9 million position; the fund has 8.6% of its 13F portfolio invested in the stock. Remaining members of the smart money that are bullish comprise Ken Fisher’s Fisher Asset Management, Ken Griffin’s Citadel Investment Group and Steven Richman’s East Side Capital (RR Partners). Due to the fact that Raymond James Financial, Inc. (NYSE:RJF) has faced a decline in interest from the aggregate hedge fund industry, it’s easy to see that there were a few hedgies that decided to sell off their positions entirely heading into Q3. Intriguingly, Jonathon Jacobson’s Highfields Capital Management dumped the largest stake of the 700 funds watched by Insider Monkey, comprising close to $106.1 million in stock. James Parsons’s fund, Junto Capital Management, also sold off its stock, about $95.6 million worth. These bearish behaviors are intriguing to say the least, as aggregate hedge fund interest fell by 6 funds heading into Q3. Let’s now review hedge fund activity in other stocks similar to Raymond James Financial, Inc. (NYSE:RJF). These stocks are Varian Medical Systems, Inc. (NYSE:VAR), Live Nation Entertainment, Inc. (NYSE:LYV), Domino’s Pizza, Inc. (NYSE:DPZ), and HEICO Corporation (NYSE:HEI). This group of stocks’ market values are similar to RJF’s market value. As you can see these stocks had an average of 32.5 hedge funds with bullish positions and the average amount invested in these stocks was $1064 million. That figure was $728 million in RJF’s case. Live Nation Entertainment, Inc. (NYSE:LYV) is the most popular stock in this table. On the other hand Varian Medical Systems, Inc. (NYSE:VAR) is the least popular one with only 30 bullish hedge fund positions. Compared to these stocks Raymond James Financial, Inc. (NYSE:RJF) is even less popular than VAR. Our calculations showed that top 15 most popular stocks among hedge funds returned 19.7% through March 15th and outperformed the S&P 500 ETF (SPY) by 6.6 percentage points. Unfortunately RJF wasn’t in this group. Hedge funds that bet on RJF were disappointed as the stock returned 10.6% and underperformed the market. If you are interested in investing in large cap stocks, you should check out the top 15 hedge fund stocks as 13 of these outperformed the market. 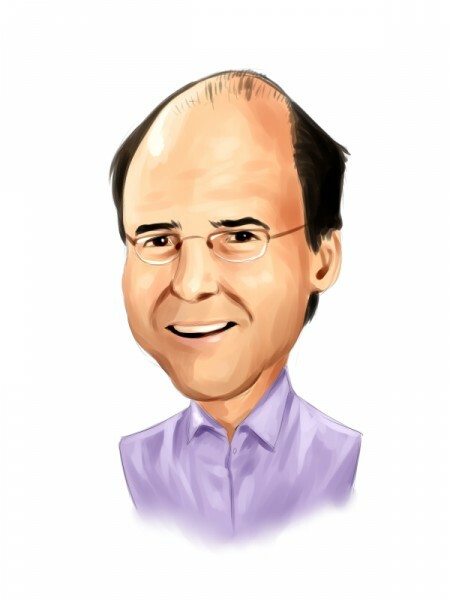 Were Hedge Funds Right About Souring On Vornado Realty Trust (VNO)? Were Hedge Funds Right About Flocking Into Marvell Technology Group (MRVL)? Is Seagate Technology (STX) A Good Stock To Buy? Hedge Funds Haven’t Been This Bullish On DexCom, Inc. (DXCM) Since 2015... Were Hedge Funds Right About Dumping Elanco Animal Health Incorporated (ELAN... Do Hedge Funds Love Lincoln National Corporation (LNC)?